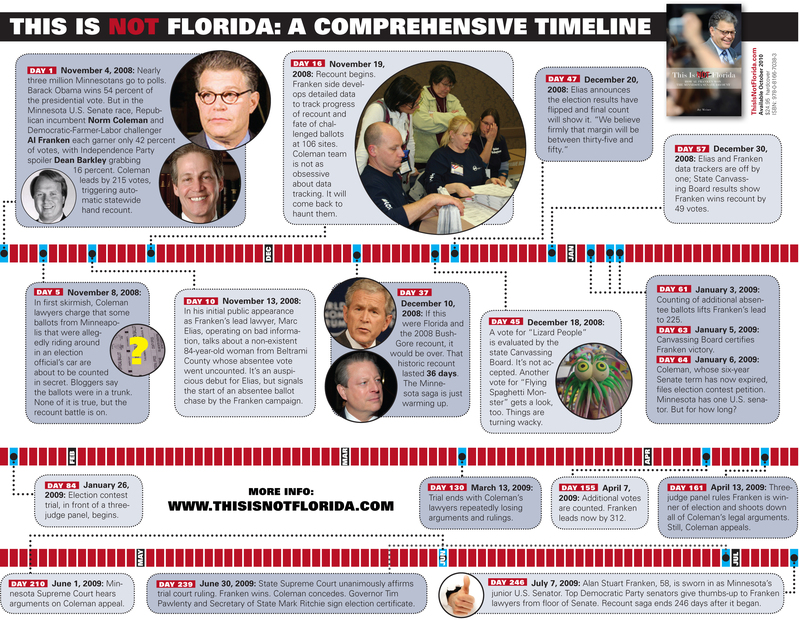 This Is Not Florida is the behind-the-scenes saga of the Franken-Coleman Minnesota Senate recount, the largest, longest, and most expensive election recount in American history. In a fascinating, blow-by-blow account, reporter Jay Weiner covers the entire recount. This Is Not Florida presents an unforgettable moment in political history that proved that it’s never really over until it’s actually over. The epic Franken-Coleman affair made Bush-Gore 2000 seem like a brief encounter. What the national media in DC observed through binoculars, Jay Weiner saw through a microscope. He's written a vivid tale of legal wrangling, political maneuvering, and chutzpah told with a sportswriter's flair that puts to rest the notion that middle American politics are dull and shows that 'Minnesota nice' is nothing but an outdated cliche. On July 7, 2009, Al Franken was sworn in as Minnesota’s junior U.S. senator—eight months after Election Night. In the chill of November 2008, Republican incumbent Norm Coleman led by a slim 215 votes, a margin that triggered an automatic statewide recount of more than 2.9 million ballots. Minnesota’s ensuing recount, and the contentious legal and public relations battle that would play out between the Franken and Coleman lawyers and staff, simultaneously fascinated and frustrated Minnesotans and the nation—all while a filibuster-proof Senate hung in the balance. This Is Not Florida is the behind-the-scenes saga of the largest, longest, and most expensive election recount in American history. Reporter Jay Weiner covered the entire recount. Based on daily reporting as well as interviews, This Is Not Florida dives into the motivations of key players in the drama, including the exploits of Franken’s lead attorney Marc Elias; reveals some of the mistakes made by Coleman advisers; and explains how the Franken team’s devotion to data collection helped Franken win the recount by a mere 312 votes. In a fascinating, blow-by-blow account of the historic recount that captivated people nationwide, Jay Weiner gets inside campaign war rooms and judges’ chambers and takes the reader from the uncertainties of Election Night 2008, through the controversial State Canvassing Board and a grueling eight-week trial, to an appeal to Minnesota’s Supreme Court, and finally to Al Franken’s long-awaited swearing-in. This Is Not Florida presents an unforgettable moment in political history that proved that it’s never really over until it’s actually over. Jay Weiner reported on the 2008 U.S. Senate recount and election contest for MinnPost.com, a Minneapolis–St. Paul news Web site. For his coverage, he received Minnesota’s prestigious Frank Premack Public Affairs Journalism Award. A longtime Twin Cities sportswriter, he is the author of Stadium Games: Fifty Years of Big League Greed and Bush League Boondoggles (Minnesota, 2000). He lives and works in St. Paul. It is a detailed accounting of the Coleman–Franken recount from start to finish ... and it is a very good read. Weiner’s lively description of the ins and outs of the recount battle will please election junkies, political scientists and political consultants. Those who were pulling for Al Franken will enjoy this detailed account of how the 2008 Senate race in Minnesota and its subsequent recount contributed to the Democrats' total of 60 senators—the magic number needed to beat back a Republican filibuster. As nasty, ugly and unappealing as the battle between Franken and Norm Coleman was, watching the two sides explore every opportunity to pick up a vote or three in the post-election recount was just fascinating. No, it wasn't Florida, as the title suggests. The presidency was not at stake. And in that contest, the Democrats lost. But they won in Minnesota in the Great Recount of 2009. And if nothing else, the moral of the story is that every vote—every vote—counts. Weiner provides a lively play-by-play of a recount that fascinated the state, if not the nation. Although Weiner's political sympathies are not difficult to discern, he makes a compelling case that superior legal finesse helped the Democrats secure the victory in the Coleman-Franken Senate race. And that, in the end, Franken had actually received the most votes. Most process books are as boring as watching U.S. Senate proceedings on C-SPAN 2, but This Is Not Florida is the rare exception. . . . This Is Not Florida brings us the calm, sober reflection of most all of the participants of one of the most engrossing political events of the 21st Century. . . . I did learn a lot. Weiner, a veteran sports journalist who was serendipitously thrust into covering the 2008 Al Franken vs. Norm Coleman election recount, adapted brilliantly, delving fearlessly into the complex legal machinations of the recount, objectively observing the candidates as they navigated through the minutiae of Minnesota election law. Weiner’s book is a significant illustration of the infrastructure of democracy: he deftly translates arcane recount procedures and legal jargon into straightforward prose. . . . Weiner often sketches [characters] in impressionistic tones that lend the book some welcome humanity amid the legal thicket of absentee ballot statutes and judicial opinions. This is an exhaustive examination and an electoral law primer written at a level accessible to all readers seriously engaged in the legal and political story. Political science and electoral law specialists will want to read it. A stark and straightforward account of key lessons for any campaign to embrace if it finds itself in a recount. This book is a highly entertaining read that nicely chronicles the political maneuverings and motivations of now-Sen. Al Franken (D), then-Sen. Norm Coleman (R), and the key players on their staffs. Those who are intrigued by both the legal aspects and the politics of recounts will find this book a treasure trove of information. Weiner does a very good job at providing a tightly-focused “you are there” perspective. An engaging read. It reads like a turn-pager of a novel, and is full of inside information on the key players involved in the Minnesota recount. Though his book is obviously of interest to political scientists and election junkies, Weiner has crafted a fascinating page-turner for anyone interested in this recount. Weiner’s book makes the recount far more entertaining than it seemed from a distance. 5. Why Are We Even Here? INFOGRAPHIC: A TIMELINE OF KEY EVENTS SURROUNDING THE 2008 MINNESOTA SENATE ELECTION RECOUNT. Stadium Games Fifty Years of Big League Greed and Bush League Boondoggles The inside story of one state’s struggle with professional sports. Inside the Ropes with Jesse Ventura A firsthand account of the remarkable rise of Minnesota’s unconventional governor. Professor Wellstone Goes to Washington The Inside Story of a Grassroots U.S. Senate Campaign This engaging account of Wellstone’s campaign, written by two political reporters, provides a behind-the-scenes look at a memorable chapter in U.S. Senate campaign history, which saw a liberal college professor become the only Senate challenger to unseat an incumbent in 1990.